09 Oct 2018 --- Sonoco has announced that it is now producing rigid paper containers as the new exclusive supplier of the German muesli manufacturer mymuesli. The packaging solution is ideally suited for both online distribution and through brick-and-mortar shops and provides superior product protection. The wall and bottom are equipped with a barrier film that replaces the conventional aluminum. This enhances the gas-tightness so that the quality, taste and nutritional value of components like grains, nuts and berries are preserved for longer. A core value of mymuesli’s products is the organic nature of its ingredients. When addressing environmentally aware customers, it’s crucial that the packaging complies with this approach as well. Sonoco’s rigid paper containers are made of approximately 90 percent finished recycling paper – which can be recycled again after use. Unlike the previous provider, Sonoco’s containers also feature a carton-based bottom, further facilitating the recycling process. The containers have a diameter of 90 mm and are 270 or 190 mm high, depending on the exact product. Sonoco implemented a new production line in Hockenheim, Germany, to produce these unusual container sizes in the required volumes. 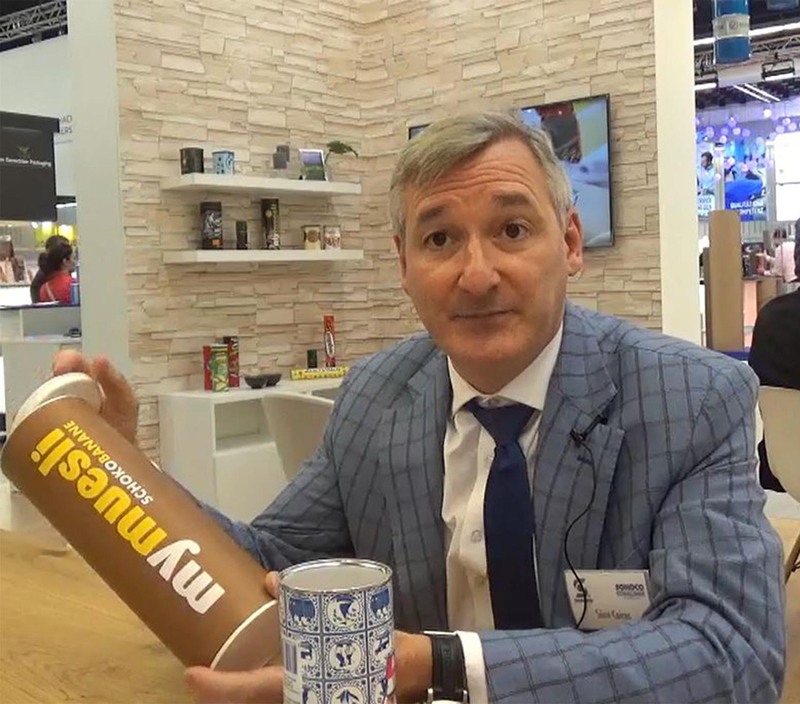 PackagingInsights sat down with Sean Cairns, Vice President and General Manager, Sonoco Consumer Products Europe, during the recent FachPack show in Nuremberg, Germany, to discuss the strategy behind the mymuesli packaging design. “The market is changing in terms of recyclability and we are seeing moves towards monostructures. As an example, if you look at the mymuesli can, we are now using a paper bottom which means the whole can may go straight into the recycling stream. Overall, the can contains around 90 percent recycled paper,” Cairns explains. mymuesli’s new packaging solution achieves advanced product protection. The wall and bottom are equipped with a barrier film that replaces the conventional aluminium, thereby enhancing the gas-tightness so that the quality, taste and nutritional value of the ingredients are preserved for longer. “When we started looking for a partner, we had two main requirements: the new container had to be built to maintain the quality of our muesli as long as possible. And we wanted to see our sophisticated designs put into practice with the highest quality,” explains Wenke Blumenroth, Head of Corporate Communication at mymuesli. Consumers can choose from a broad variety of muesli mixtures that come in different styles of packaging, ranging from individual colors in high-quality print to advanced designs with hot foil embossing or printed floral patterns, in addition to many more. To underscore the eco-friendliness of the containers, the sidewalls can be finished with natural paper, evoking a natural look and feel. On the inside, the container is now white instead of the previous glossy silver, creating a consistently high-grade look for the packaging as a whole. Thanks to their convenience and standout appearance, mymuesli containers are also very popular as storage containers in consumers’ households. The easy-to-open and recloseable snap lid provides high convenience and protects the product and its taste after initial opening. Since they are used in consumer’s households long after their original contents are gone, the unique mymuesli designs have a steady impact on consumer awareness, strengthening the brand’s image. In addition, Sonoco’s rigid paper containers are extremely solid and stable – a key consideration for mymuesli, since online distribution remains the core of its business. Already sealed and wrapped, the containers need no further protection on their way to the consumer. “With mass-customized, organic muesli via online shopping, mymuesli has been filling a market gap from its early days up until today. As its production volumes continue to grow in the years to come, we at Sonoco are ideally equipped to cover its demand in the long term,” says Sean Cairns. The German company mymuesli provides health-aware and sustainability-oriented consumers with muesli mixes that they can compose themselves. With Sonoco Europe, mymuesli believes it has found the ideal supplier for its iconic packaging. 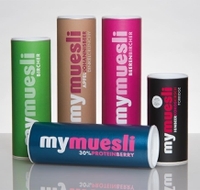 Founded by three students as a webshop in 2007, mymuesli now also operates more than 40 stores in Germany, Austria and Switzerland, and is home to over 750 employees.